This is were the idea began…. I had filled this dough bowl with driftwood that I had gathered from the river. Have you ever been doing something that people look at you with that “look”? Well, I got plenty of “looks” as I was gathering a very large arm full of wonderful driftwood. We had pretty heavy flooding this year, so there were a lot of large trees and tons of driftwood to be had for the gathering. It was a Church 4th of July picnic, coupled with a baptism!! Now, I didn’t start ’til after the baptism was over and everyone was eating, however I did get a lot of “looks”! Some people just don’t understand the creative mind! Could they NOT picture the beautiful bowl filled with all the weathered, organic and simply wonderful pieces of nature?? Okay. Back to the dining room. After taking these pictures (and they’re bad, I used my phone!) I could see that I had too much wood!! 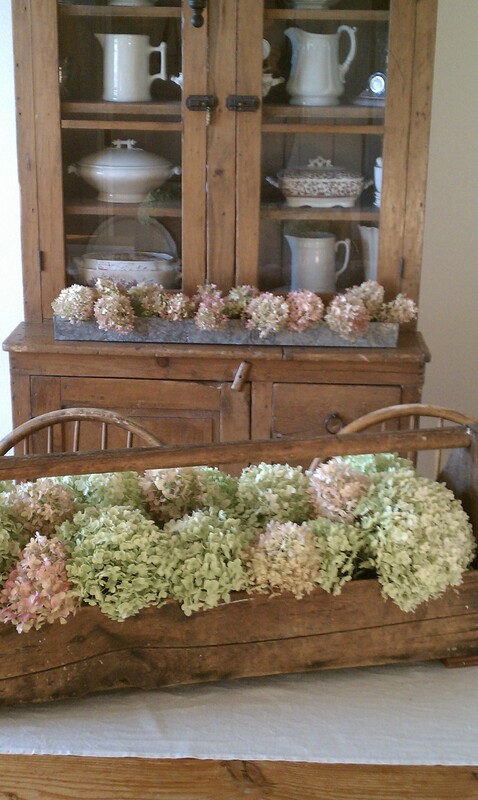 Too much wood with Hydrangeas from my garden…. And realized I needed to change things up. But I was on a budget. Tight budget. Of course I had ideas of how I wanted it to look, in a perfect world. So I started checking all the usual haunts and found some used upholstered chairs. 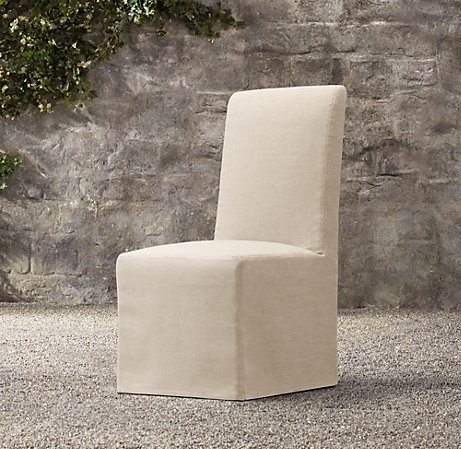 The plan was to sew some nicely fitted slip covers from French linen, to look like these…..
After tracking down enough yardage at a surprisingly decent price, I stood poised over the “add to cart” button…. Then realized I did not have enough time for the linen to come from France, make a pattern, sew four slip covers and get everything ready for my kids to come home for Christmas. So I ordered some online, they didn’t fit, returned them, ordered different ones, but they were not the fitted look I wanted, hhmmm, tick tock. In the end I kept the ones that were not as fitted, but fit the rolled top better. 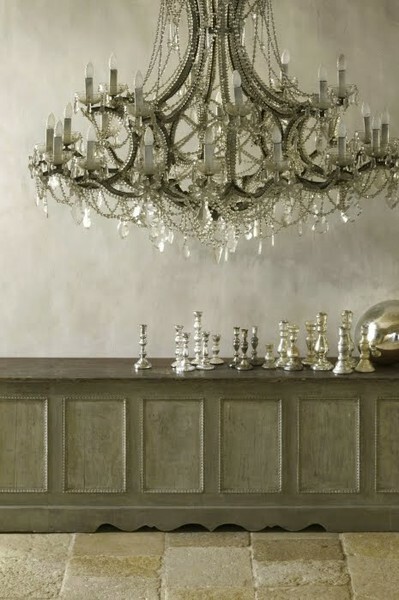 Next, I found that I was drawn to all the wonderful chandeliers I had been seeing on pinterest……. Now, I couldn’t really change the light fixture, so I added some chandy like touches to make it sparkle! 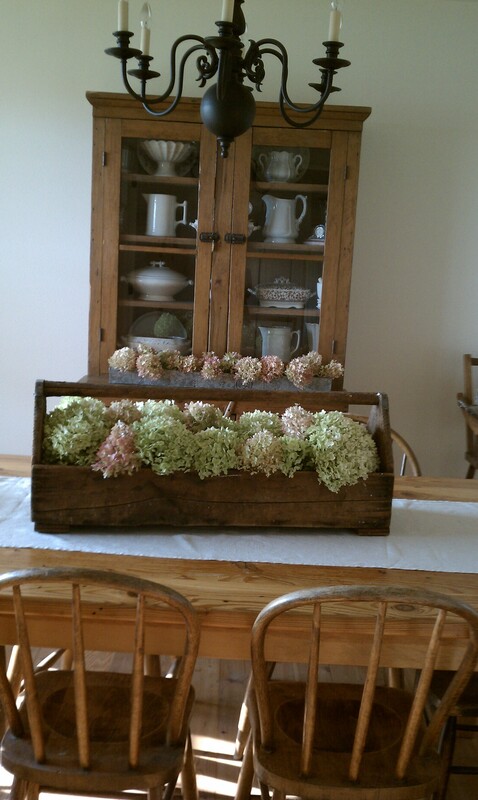 My brother in law made the farmhouse table for me out of reclaimed barn wood several years ago before it was all the rage. However, the finish is worn, and I need to redo this table this year. Can’t decide which way to go. Paint the legs white and strip the top. Paint the legs white, stain the top to look weathered. Strip the table and stain legs and top to look like the weathered/raw wood Restoration Hardware table. Any help on this decision would be appreciated!! This is the view as you come in the front door into the living room. I am so glad we added the french doors, as this is really the only architectural element in our basically average house. Side bar….looking for a different grey for this wall. I painted it Light Gray from Farrow and Ball, but it is just too green for me. Lighter or darker? Still looking for just the right thing to hang on the wall on each side of the cupboard. 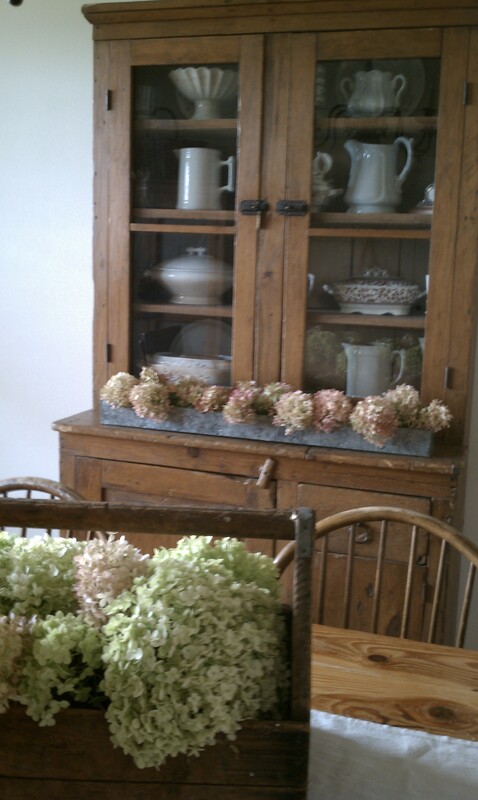 Will show you the rest of my little dining room after I finish the last minute touches! Cindy, This looks lovely! I love the rustic wood up against white. Always enjoy your posts! I have to say that I love your before pictures! Your wood is gorgeous. 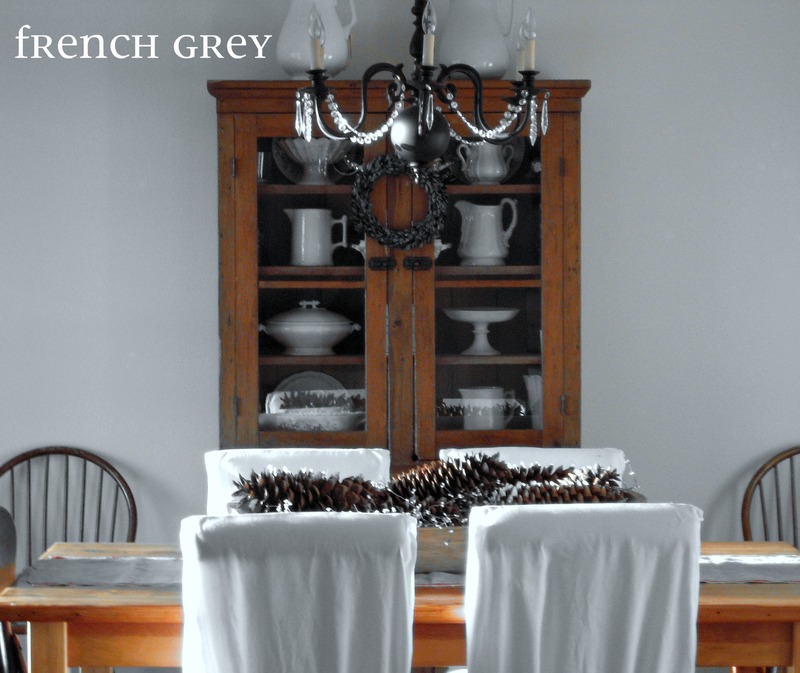 I’d spend my money on a great chandelier, keep adding ironstone, use some grainsacks on the table, and just add some French accessories. 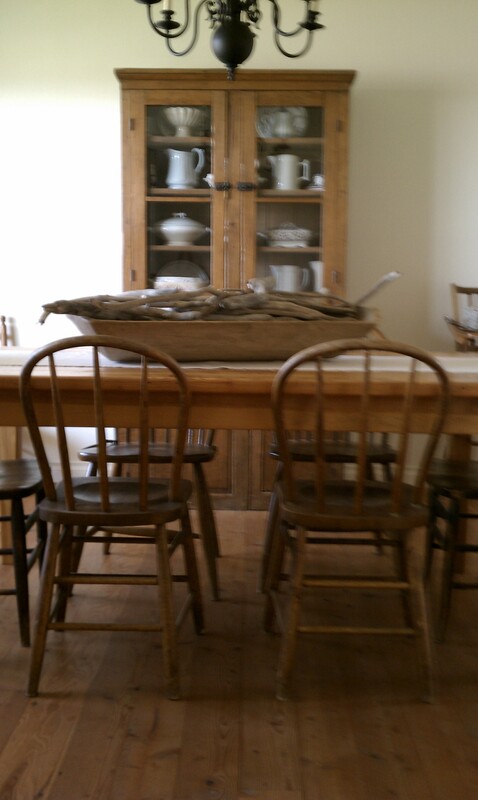 I would keep your table, chairs and hutch just as they are. I love that you loved those trees. The photos of their canhge is interesting and beautiful. And your acceptance of their canhge into a table is also lovely.Change is everything and your acceptance is too. 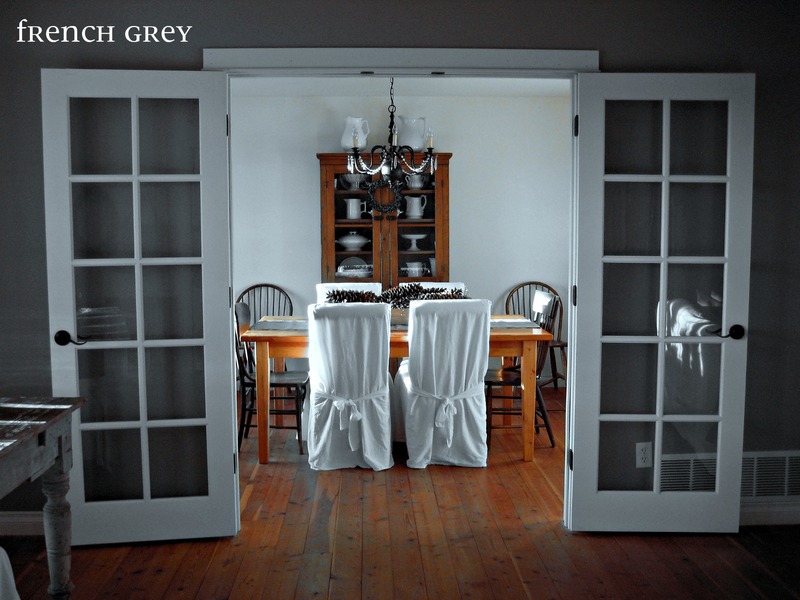 Love the way your French doors frame the view into your dining room! Your furniture is lovely the way it is, but if you’re looking for a change, I would paint the legs and ‘weather’ the top – funny I’ve just spent my weekend doing just that to a second hand table. 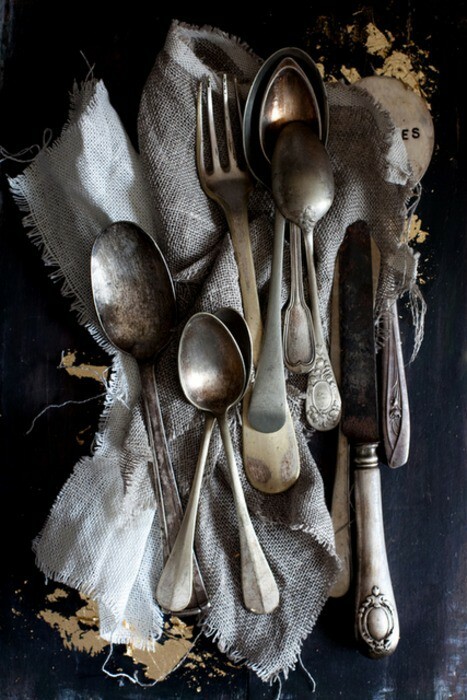 Love the slipcovers and your ironstone collection is beautiful, I must get some. 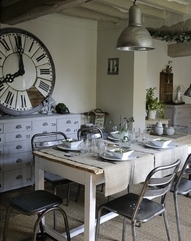 Re Farrow & Ball, I love their paints but alot of their colours have a greenish tint in certain lights, I think the Light Gray looks lovely but would need to see the rest of the room to say whether to go lighter or darker!! I agree with La Vie en Rose comments. I would paint the legs and weather the top. 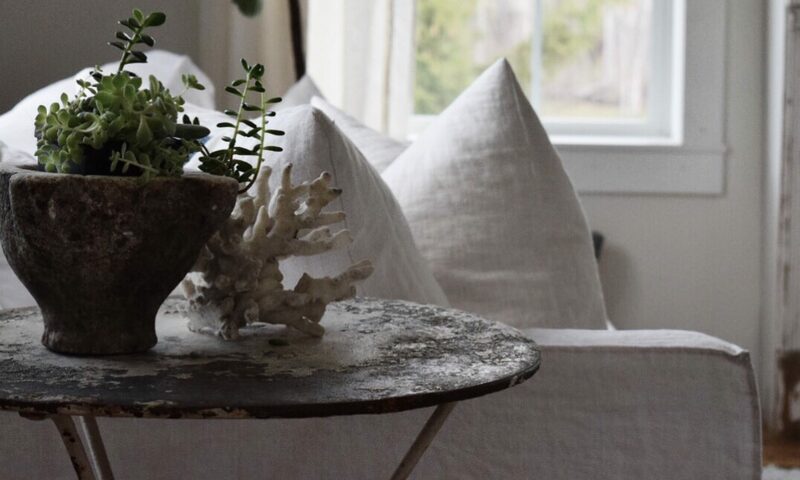 I would also add grain sacks for table runners. I would also spend my money on a great chandelier. I really like the ones on the Wisteria website. I am loving the Swedish look, so my preference would be to make the walls lighter, but that is only my taste. I do love the Farrow and Ball paint, it is wonderful to work with. I like the shaded white or old white. That chandelier reminded me right away of “Phantom of the Opera”! Awesome! What a lovely room. I too love a white palette mixed with the warmth of wood. Now that you have slipcovered your chairs in white, I don’t think you need to paint the table legs. Either way it will look gorgeous!